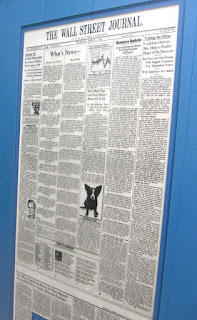 On the day of “How Many Dogs Can Fetch Money?,” my Carmel, California home phone rang at 5:00 a.m. with the news. Long before the internet, the Rodrigue Gallery phone continued ringing for a month. At daybreak I purchased ten newspapers from the Carmel Drugstore, where two men asked for my autograph. I was flabbergasted. In addition to clients, reporters, and publishers, George received the one call he most wanted. The following week he flew to New York and met Roz Cole, Andy Warhol’s legendary book agent. I wasn’t in on those meetings, but after years of working with publishers I imagine what it was like. George grew frustrated defending his work and convincing the book world of his project’s marketability. Eventually, Viking Penguin committed to a Blue Dog book, and George and I committed, coincidentally, to each other. This landed me, albeit peripherally, in my first publishing project. We began at Viking’s offices in New York City in the fall of 1993. 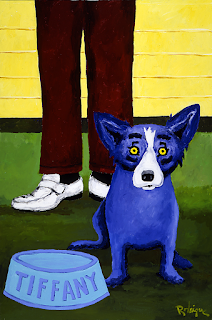 The book, Blue Dog, would feature Rodrigue’s paintings and an imaginary story by George and author Lawrence Freundlich. In a large boardroom, a team of editors, art directors, and marketing strategists explained the book, a paperback retailing for $20. George sat dismayed and considered abandoning the project. They still did not understand his work. A cheap book only cheapened his art, and he had no interest. Suddenly, Peter Mayer, Penguin Books' near-mythic CEO, burst in the room. In five minutes he transformed the paperback into a hard cover book with slipcase, hologram, and other special features, retailing for $50. He congratulated George on his art, leaving the room as fast as he arrived, having altered permanently a project and attitudes. The book, with an innovative design by Alexander Isley, tells a touching story of Blue Dog, first as Tiffany living in George’s Lafayette studio and, following her death, her ghost’s cry for his attention. In the fictitious tale, she haunts his dreams and eventually lives again through his art. Viking printed a cautious 5,000 copies of Blue Dog, released fall of 1994. The book’s popularity surprised nearly everyone but George, and the publisher reprinted quickly, now topping 200,000 copies in five languages. 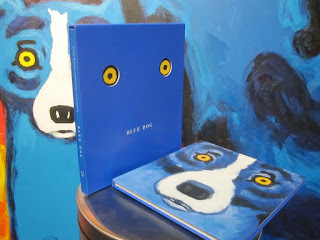 Blue Dog is a legend in the world of art books, something people still talk about when we visit New York. Since Blue Dog, George published books and calendars with Stewart, Tabori & Chang, Harry N. Abrams, Sterling and Rizzoli. He embraces these books as works of art, reflecting his on-going confidence in his vision and his enthusiasm for such projects. With The Art of George Rodrigue (Harry N. Abrams, 2003; revised 2012) and George Rodrigue Prints: A Catalogue Raisonné (Abrams, 2008), he experienced his proudest publishing achievements since The Cajuns of George Rodrigue (Oxmoor House, 1976), career retrospectives with critical texts by Art Historian Ginger Danto and Director Emeritus of the New Orleans Museum of Art, E. John Bullard. .....I’m delighted to share, a Fall 2013 project for me with UL Press. This is so exciting. I hope the publisher knows these blog posts are set in stone and flawless and absolutely cannot be changed by a single keystroke or the gods of words will rain down on Lafayette and forever make them afraid. Can't wait!!! I loved this story. Wendy, your storytelling style is so vivid, I felt like I was in the room, rooting for the hardback verson and actually said "yeahh" when it happended. Thanks for making everything multidimensioned! George's story just keeps getting fuller and fuller! close to him. They had it beautifully framed and proudly hangs in our living room...So many people can't believe I was presented with one of his beautiful prints from 1988. Many thanks for sharing, Elwood. What a wonderful gift and memory. George and I are so pleased that his artwork is a treasure in your home.